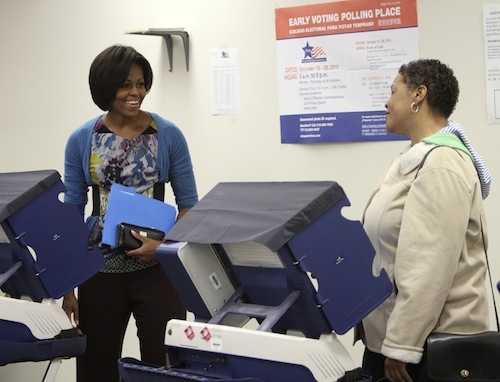 First Lady Michelle Obama stayed in Chicago once again today, visiting the Early Voting Polling Place. She kept her appearance a bit more casual for this event, opting to wear a multi-print blouse paired with a blue cardigan and black trousers. Her waist was cinched in by a black, oversized belt. This look definitely says “Michelle.” The oversized belt paired over a cardigan has been Mrs. Obama’s signature look since her time in the White House. I think pairing a belt and cardigan is a great idea! However, why does the cardigan always go under the belt? In my opinion, Michelle’s ensemble would have looked much more becoming if the belt was wrapped around her blouse and the cardigan was placed on top of these two pieces. As far as the belt goes, the term oversized does not seem to describe how huge this belt really is. It looks extremely uncomfortable, and is distracting to the eye; people will be looking at Michelle’s outfit instead of her. This entry was posted in Campaign Trail, Michelle Obama. Bookmark the permalink. Frankly I think that’s abslulteoy good stuff.